After we saw it, everyone was talking about Openings. The filming was excellent, the music was haunting and lovely. I wanted to go out and buy the music. The story was great and so was the acting. The one thing everyone said was, they wanted to know more. The message is superb and enlightening.... that’s a rare quality in a film today. I loved the photography, the music, the directing and the acting. The casting was perfect down to every detail. Each character was believable from the very beginning. I was very moved with the subject of the movie, and it hit me right in the heart. I was filled with emotions. I could relate to the hardships of the lead actor, Harry. It was like looking at my own life as it as been so many times. I could feel the pain he felt, and his hopelessness. The interviewees brought it all together beautifully with the reality of life, and their practical solutions. It was impossible for me to hold back the tears and laughter throughout the movie. In the end, the tears of joy were unstoppable. I will never forget this movie, and I thought about it all day today. I looked at every opportunity to see greatness around me. I let go of some bad energy, and looked for all the doors that were open to me that I was not seeing before. I feel the movie moved me in a direction that will bring the best out of me, and my closest family members. The message I really took to heart is, we do not always have to think positive, but we have to let the positive and the negative flow in and out of us. We have to let go of the past, and open our minds and hearts to what really matters on this planet. I can’t wait for the opportunity to share this movie with my family and friends. I will personally watch it again and again. I need this movie as a constant reminder to keep on hand. For me, it was really life changing, and inspiring with a hope for a better future. Thank you so much for the opportunity to preview your film! It is very powerful, I enjoyed it very much. Wonderful reminders of who we are. My son, Ryan, posted on facebook – “take off your masks”! Bravo! The way you blended the interviews with the story line was masterfully done! The music was great! Looking forward to owning the soundtrack! The film moved me and Steve in so many directions, we are still talking about it. No matter what a person’s spiritual preferences are, this film is a catalyst for discussing and examining what you believe to be true. As it is written in the Hebrew Bible: “Let us reason together” and that is what this film encourages, for us to sit and reason together this thing called life that is much bigger than we think it is. Jesus said, “Knock and it shall be opened...” Thank you for sharing your vision and passion with us and the world. Because of this film I am now looking for my own openings... Sending you blessings for much success! Openings is a beautiful work of the heart. It has been such an honor for us to be involved, watch the creative spirit and loving relationships that both of you (producers) develop and continue to nurture, and see the love and respect you have for each other. Last night was a very special night and touched us deeply. I know that you have worked tirelessly on this project and have been blessed by the process. May you prosper in all areas of your lives because of this and the other work done. The film struck me deeply. Thank you for this moving movie. It shows entertainingly that everyone can find a way to make changes at the deepest levels of their lives. Your interviewees make it clear that the openings to these changes are all around us if we look for them. This is definitely a great movie. I loved the narrative between scenes from the spiritual leaders. It was thought provoking. Remembering to listen to our hearts and not our minds was very inspiring. And how effortless it can really be if we do. Definitely a 4 star for me! A wonderful portrayal of the story of who we are, or can be. The weaving of narratives with the story line “tells the story,” in a way that bipasses the mind, touches the heart, and reminds us of what we (or I) tend to forget. So nice to remember the Truth! This one grabbed me by my heart-strings. And, having many of the thought leaders that I look up to essentially guiding me through the movie’s story really added to the lessons taught. This format is doubly good for me. And the “I am loved” song at the end brought me to tears. I needed this! Synchroneity is what happens if you relax after you ask a question and the answer appears as if by magic. Very nice and lovely movie. Helps me understand about my inner spirit and how it helps me follow my purpose in life. This insightful and instructive movie contains segments of a story unfolding w/interpretive cutaways to progressive minded new-age personalities. It’s an ingenious concept to merge true experience with a master mind of engaging interpretations. The new-age speakers were a highlight for me and I felt as though my own belief system was expanding as a result. I particularly resonated with Gregg Levoy, Jacob Liberman, and Bart Szollose. The movie’s structure of action followed by interpretation is parrallel to what occurs in the human brain specifically after a strong emotional event. I loved the speakers and concept and look forward to more material in future. I saw Openings at a screening last year and am excited to review it. I must say I am most impressed with this movie’s content: it is not purely entertainment. The story is moving and inspiring and includes thought-provoking statements from unique free thinkers and present day philosophers. The photography is excellent and the music is extremely uplifting. I hope eventually to be able to buy a soundtrack. To the authors and directors of Openings, thank-you for your contribution to our society. I hope everyone who reads this gets the chance to see this movie and highly recommend it if you are thinking of making the purchase. I found “Openings” to be a very refreshing, thought-provoking look at the frustrations of modern life, with lots of creative and interesting ways to look at the problems we all encounter. Most of the speakers featured were articulate and interesting, the actors did a good job of portraying their characters, and the scenery was breath-taking. It was nice to leave the theater for once feeling uplifted and inspired instead of exhausted by car chases and buildings being blown up. Openings speaks to the process of opening oneself to everything that is around you and to experiencing life to the fullest. Harry is lost soul, lost to love, lost to family, lost to life until he realizes that he too is special and that he can communicate on a whole new level with those around him. This is a wonderful movie full of inspiring and powerful emotions. It is dramatic, comical and at times sad, but always full of wisdom. I brought several friends to the premier of the movie who were unsure of it’s content and message. At the end they all agreed that they were ready for it’s message and they received it’s lessons openly. Great work! I recently saw this movie and found it to be very insightful. It was a wonderful story of a man’s journey to find himself. I would definitely recommend this to anyone searching for a more meaningful life. I especially liked the realness of the characters. Each actor/actress did a nice job. This film is one that lingers in your consciousness...often funny, it is a heart-opening story about a man, Harry, finally coming-of-age by accepting personal accountability for the mess he’s made of his life, and then opening up to the seemingly synchronistic events that transpire, transforming him. The story is skillfully interwoven with insightful dialogues from notable New-age personalities. A MUST SEE! 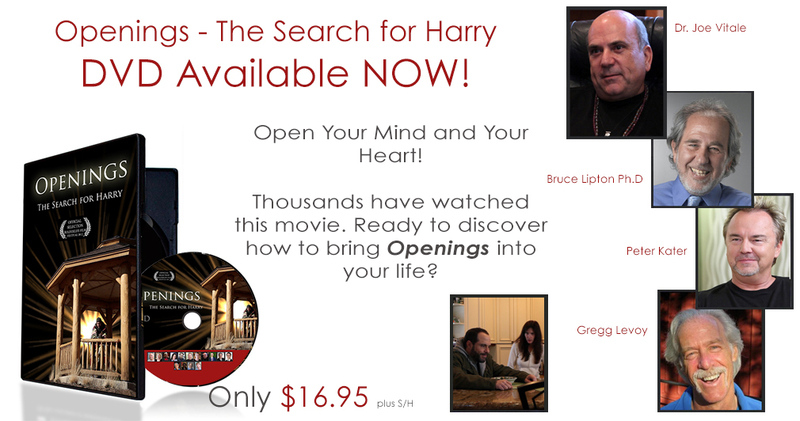 “Openings” I heard a local film company released a docudrama and it was showing at a small theatre in town. I went to see what it was about and was pleasantly surprised. It was a new type of film for me with a story line and documentary together. I really related to Harry’s experience for myself and so many people. The speakers and the story bring back what is important in our lives. It touches your heart and you realize that love and family are what is most important and to let go of feeling like a victim. We are capable of creating our lives the way we want and that things happen for a reason. Circumstances and events that come our way have something to teach us and we should pay attention to the signs in our lives. Focusing on what we want and surrounding ourselves in a healing and positive environment. This film makes you think, laugh, and is heartfelt. The Colorado mountains, the views and the log cabin was a wonderful back-drop for the film. The film is Fabulous!, thanks for making it...I cried and laughed, very touched and inspired.